This is a beautiful log-sided cabin with rustic mountain decor, hardwood floors and log furniture. 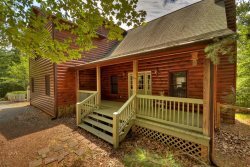 Enjoy the creek view from the wrap-around deck, or play horseshoes by the outdoor fire pit. The cabin sits on almost 3 acres for lots of peace and quiet..